– Franklin sealed its postseason berth with a win at Asiaf, scoring once in each the first and second periods before tacking on two more in the third. Zac Falvey, Jeremy Miller, Scott Elliott, and Tom Tasker each had goals for the Panthers. OA senior Eric LeBlanc had the lone goal for the Tigers on an assist from sophomore Hunter Costello while sophomore Owen Connor made 35 saves in net. – Freshman Natalie Stott tossed another shutout in net for the Panthers, while Amanda Lewandowski and Jordan Dwyer added the goals, to clinch Franklin’s spot in the postseason. 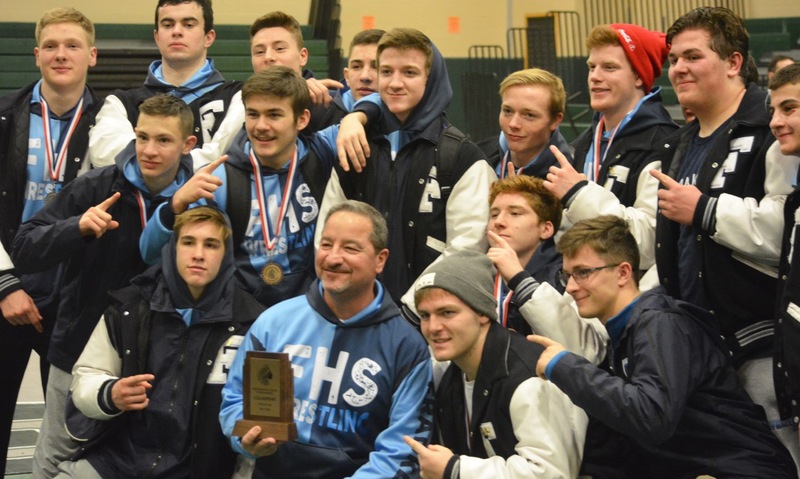 "For the second straight season, Franklin took home the team title at the annual Hockomock League Wrestling Championships, held on Saturday at Canton High. The Panthers finished with 245 points to beat out second place North Attleboro, which finished with 217.5. The Outstanding Wrestler of the tournament was given to Mansfield sophomore Vinnie Holmes, who needed less than a minute to win the title by pin at 182 pounds. Led by Holmes, fellow unbeaten wrestler Jayden Curley, who won by pin at 160, and George Glaropoulos, who won 16-1 at 152 pounds, Mansfield took third place with 168 points, just two better than Foxboro’s 166. Canton took fifth place on the day with 125 points and earned two individual titles as well. Eddie Marinilli, who won at 126 last year, jumped up to 138 for his sophomore season and won by pin to earn his second title in as many years. At 132, Anis Chakir trailed 2-0 heading to the third round, but scored three points including a reversal in the final 30 seconds of the match to win the title over Franklin’s T.J. Remillard. The Panthers had five wrestlers reach the finals and brought home two individual titles. Jake Carlucci won 11-2 to get things started at 106 and then Ian Bakalars got a third round escape to edge North Attleboro’s Dan Cooper 3-2 to win at 120." Hock Championship Individual Results: 1st- Jake Carlucci, Bakalars. 2nd- Remillard, Polito, and Johnson. 3rd- Jordan Carlucci, Racca, Cogavin, Sackley, Maclean. 4th- Sauer, Coughlin. 5th- Downing.